Discover benefits of tomatoes! They are healthy for the body, skin and hair. Tomatoes are low in calories with a high water content. They contain a good source of vitamins, minerals and fiber. Caution, though, they are naturally acidic which can cause heartburn. So watch your intake of tomatoes, no more than two servings per day. Avoid tomatoes, altogether, if you have acid reflux disease. Tomatoes are rich in antioxidants, especially lycopene. Grow tomatoes at home or buy them at your local grocery store or farmers market. Purchase tomatoes that ripen on the vine. Avoid buying over ripe or soft tomatoes. Store at room temperature, away from direct sunlight. Eat raw organic tomatoes, avoid pesticides and other contaminants. Cooking tomatoes destroys their nutritional value. Drink organic tomato juice. Organic tomato juice contains three times more lycopene than regular tomato juice. Make homemade juice with juicing recipes. Some store bought juices contain a high sodium content. Read labels carefully. Retinol is a fat soluble antioxidant vitamin. It's essential for proper vision and bone growth. It's successfully used for treating acne, pimples or blemishes. Beta-carotene is a yellowish-red pigment. It's found in many green vegetables and orange colored fruits. The body converts beta-carotene to vitamin A, when necessary. The redder the tomato, the more beta-carotene it contains. Improve bone metabolism, Guard against heart disease, Help prevent night blindness, Help eyes adjust to light changes, Promote strong bones, Guard against viral infections & strokes. VITAMIN B: Reduce Stress, Promote Cell Growth, Regulate Metabolism, Maintain Muscle Tone, Boost Immune System, Promote Good Digestion, Enhance Nervous System, Convert Glucose into Energy, Reduce Risk of Pancreatic Cancer, Maintain Skin Tone, Aids in Cell Reproduction for Skin, Hair and Nails. VITAMIN C: Helps prevent: Cardiovascular Disease, Inflammatory Disease, Diabetes, Eye Disease, Duration of Common Cold. Protects Immune System. Produces Collagen, Prevents Skin Wrinkles, Strengthens, Firms and Softens, Allows Development of Scar Tissue, Speeds Healing of Small Wounds, Cuts, Burns. VITAMIN K: Helps prevent: Hardening of Arteries, Heart Disease, Osteoporosis, Cancer. Promotes Blood Coagulation & Circulation; Initiates Healing. Binds Calcium to Bones. Strengthens Capillary Walls. Promotes Bone Density. Has Anti-aging Properties. Provides Facial Rejuvenation. Aids in Reduction of: Bruises, Broken Capillaries, Dark Under Eye Circles, Spider Veins, Discoloration, Mottled Pigmentation, Puffiness Under Eyes. Tomatoes, with vitamins A, C, E, have a high concentration of antioxidants! Tomatoes are rich in lycopene, a natural carotenoid, with powerful antioxidants and anti-inflammatory properties. Cherry tomatoes contain more lycopene than large tomatoes, gram for gram. Our bodies are under attack, daily, by harmful chemicals. Antioxidants protect cells from unstable molecules causing free radical damage. Free radicals speed up the aging process of skin by breaking down collagen and oxygen levels in cells. Antioxidants reverse skin damage. Boost immune system, assist skin repair, strengthen blood vessels, reverse discolorations, reduce wrinkles and protect against sun damage. Tomatoes are used for making homemade soap. 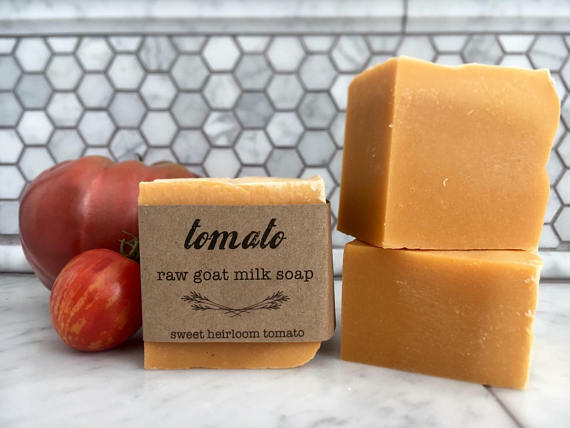 This 6 ounce bar of tomato goat milk soap contains ingredients including: olive oil, organic virgin coconut oil, raw goats milk, lye, fresh organic heirloom tomato puree. This homemade soap lathers up to cleanse, soften, moisturize, clear and maintain complexion. Prevent pre-mature aging of skin. Acne Relief: Shrink large pores. Tomato acidity helps balance skin and get rid of excessive oil. Moisturize: Tomatoes have a high water content. Goats milk is a buffer that leaves skin very close to its natural pH. Goats milk soap is a natural moisturizer. It gently cleans without leaving oily after effects. Prevent Pre-mature Aging of Skin: Tomatoes are a natural astringent. They tighten skin. Reduce wrinkles and fine lines. #1: Apply tomato pulp on acne. Rinse well. Gently pat dry. #2: Apply tomato juice to face, regularly. Rinse well. Gently pat dry. #3: Make a homemade juice. Mix tomato juice with cucumber juice. Apply mixture to face, daily, to remove excess oil. Control acne break-outs. #1: Increase the natural pH of hair and help restore to its natural color. Tomato is a natural conditioner. Apply tomato juice or slices to hair. Wash out with shampoo. Rinse with water thoroughly. #2: Get rid of dandruff. Apply tomato pulp to hair/scalp for approx. 15 minutes. Wash out with shampoo. Rinse with water thoroughly.